Alevelsprogramme.com has released the schedule of IJMB fees of all students who registered for IJMB programme for the 2018/2019 session under her centres. Our Registered students are to note that Acceptance fee of N15,000 must be paid before they can resume to commence registration for academic activities. The Clearance exercise takes place at the school premises as students resume. 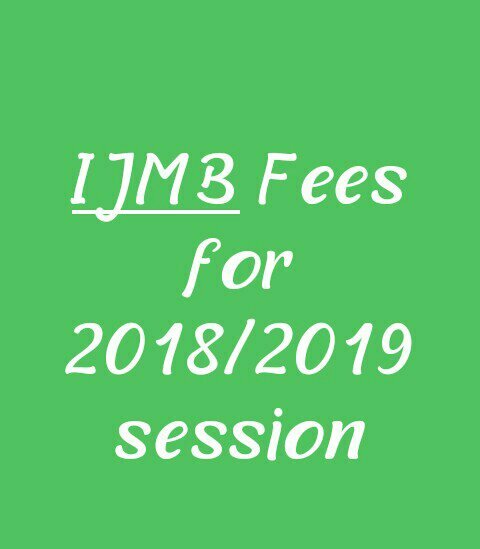 SCHEDULE OF IJMB FEES FOR 2018/2019 ACADEMIC SESSION. Tuition: Tuition fees vary from centre to centre. Below is the list of tuition fee for our study centres currently available for registration. The following payment covers the acceptance fee, accommodation fees and school fees. Students should also note that we accept part payment and that all payments should be completed four months after resumption. IJMB fees: for students who do not have the complete fee, A minimum payment of 50,000 should be made on resumption. The least payment propective students can resume with is N80,000 before balancing up later. It includes N50,000 for school fee, #15,000 for hostel and the N15,000.00 for acceptance. Prospective students should note that we register students in batches. Students registered between November and middle of January are under batch A. 1. Acceptance fee payments should be made to our acceptance fee account on request of the students. Kindly call us on 08148501101 or 07019103120 to request for our account number. 2. Installment payment of at least 60% is available on request provided the remaining 40% payment is made before the fifth month after resumption. 3. Clearance and resumption for all batch A registered students comes up within three weeks of resumption. Please note that students who fail to do their clearance within the stipulated period will pay a late registration penalty fee of N15,000.00 (Fifteen Thousand Naira Only) . Hurry!!! the application form is still on sale, for full details on how to apply click IJMB Application Form and registration details. For Related questions, kindly use the comment section as get answers as soon as possible. Previous Post:Ijmb Registration centres in Lagos, Ogun, Ibadan,Ilorin and Edo state. My son wants to study medcine, if he go through the ijmb program, will he be able to get admission in Federal or states schools?